The Challenge: To create a mobile responsive website that speaks to “Joe Public”, who often gets shuffled aside by the large financial advisor / institution seeking only those with tens of thousands to invest. Potvin Financial Services is interested in clients from all walks of life, including the young couple looking to get started with their financial future. 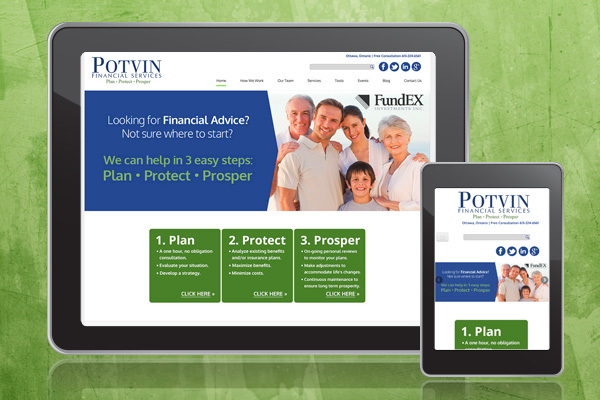 Together with Potvin Financial, we created a website that would connect with both the person seeking answers about “what is a financial advisor” to the client who needs someone they can trust with their existing financial portfolio. We also worked on the SEO of the website together with an SEO expert who is part of our team, to fine tune the website to come up in Google for certain search terms. As of this writing (April 2016) the website comes up #9 in an organic Google search for the term “financial services ottawa” out of 605,000 results and #1 for the term “financial services ottawa” out of 3,020,000 results.